As I sit here watching Sidney Crosby: On the Ice and Beyond [again], I can't help but relive the memories of last year. I purposely wanted to watch it before tomorrow's game to get that sense of losing that I had a little over a year ago. That may sound strange. But really, in addition to making me feel like I'm getting to know Sid personally, this video helps me feel what it was like. You remember how we acquired Hossa and breezed through the playoffs, seemingly ahead of our time. Only to face a Red Wings team that bullied us up and down the ice. Yes, I wanted to know that sense of losing again. By now you're probably asking yourself. "why so pessimistic." Well, its not pessimism, its really not. It's actually strengthening my confidence for this year more. How? Well, this year is different, it really is. The Pens are in the same position as last year, only one game closer. And last year we didn't face Ovechkin in a game 7 on the road; I really believe that taught us something. We all know how in the offseason two of our key players decided they'd sign with the enemy. They apparently wanted a Cup and didn't think this Penguin team had what it took. They lost confidence in this their Captain and his team. Hossa took much less money [over time] because he'd rather play with veterans than get a chance to help carry a team with two of the brightest stars in the game. So much for leadership. Though unlike Hossa, we haven't lost confidence in the Pens. Neither has their Captain. 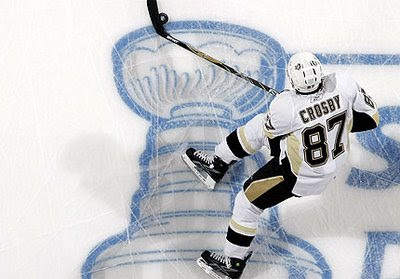 Crosby once again carried his team to the finals and helped instill confidence in each and every guy out there. Malkin has been steller, Fleury an animal at times, and the role players have come up huge. I haven't seen a better team effort in my life out of the Pens than what I witnessed this past Tuesday. Everyone gave their all. Our third line scored 2 goals which was enough to beat the Wings at the Igloo. But now it comes down to one game, the 7th meeting between these teams. The coup de grâce. This really is for all the marbles. I would suggest not even bothering to listen to the critics. I'm not going to give you a prediction nor list any of those out there. This game is not going to be about momentum. I really don't believe its going to matter who is on home ice either, Mr. Melrose. Each and every player on each team knows what this means. Its their last game of the season; its their last chance to get a win; maybe even their last chance to win The Stanley Cup. I did the same thing. I've watched that video about 10 times throughout the playoffs. It gears me up a notch. I wonder if Bylsma has ever watched it?